Maj. Martin “Sjeng” Van de Pol and James “JB” Brown unveil the F-15 during the first annual Pilot’s Roll Call at Bravery Brewery. All aerospace enthusiasts were invited to attend the event. 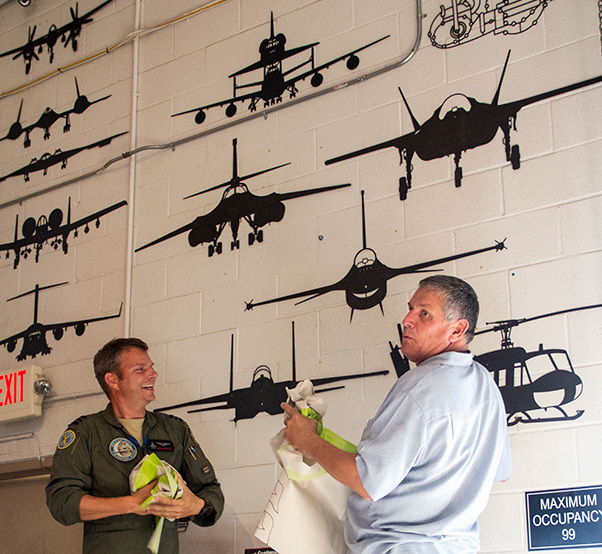 Dutch F-16 fighter pilot Maj. Martin “Sjeng” Van de Pol, Virgin Galactic pilot Todd “Leif” Ericson, and a few other dads were having a beer at Bravery Brewery to celebrate their son’s great soccer season when the conversation turned towards the “Planes of Fame” wall. Both Van de Pol and Ericson flew F-16s for their respective countries and agreed that the wall needed a Fighting Falcon. 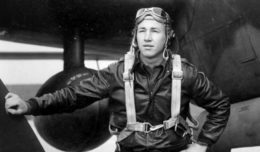 A few weeks later, at a pin-on ceremony at the brewery for Lt. Col. Chris “Bluce” Wee, Van de Pol said other pilots declared that an F-15 needed to be added to the collection. “Since there has always been quite some professional rivalry between F-15 and F-16 pilots, such as between Bluce and me, this was a reason to also invite the F-15 pilots from the AV,” explained Van de Pol. “I mentioned this to Bluce and he agreed. The intent would be to try to keep that rivalry alive.” To make it even better, Van de Pol decided to invite all pilots from the Antelope Valley and make the Pilots Roll Call an annual event. Lockheed Martin F-22 test pilot Steve “Hooter” Rainey and James “JB” Brown, test pilot and vice president of the National Test Pilot School in Mojave unveiled an F-16 model, with a few cheers and friendly hisses from the crowd, followed by nominations from the audience for next year’s unveiling. “Russ Gibbs always makes such beautiful models and is very reasonable,” said Van de Pol. John “Ferg” Fergione, former Navy and Lockheed Martin test pilot, suggested SpaceShipTwo, because it is the future. Lockheed Martin photographer Kevin Robertson suggested the F-117 Night Hawk. Mark “Forger” Stucky, a Virgin Galactic pilot, nominated the F-4 Phantom, and Van de Pol nominated the F-18, because it is so similar to the F-15 and F-16. 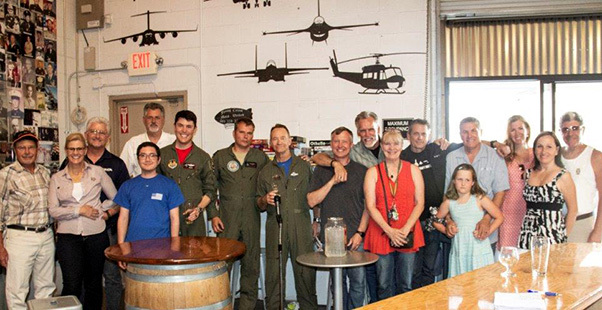 Pilots, family and friends gather at Bravery Brewing for the first Pilot’s Roll Call June 22. With the help of guests and human audiometer, F-16 test pilot Maj. Chris “Beast” Taylor, the crowd voted to have the F-4 Phantom added to the wall for next year’s call. Van de Pol suggested that they may schedule Roll Call around the LA County Air Show, so more pilots can participate. “This was so cool,” said Sean Threatt, who flew in from Olympia, Wash., for a first date with Morgann Simmons, who lives in the Antelope Valley. “This was totally unexpected and fantastic.” Threatt has a commercial pilot license, but said his dream job would be to be a test pilot. “To see these guys here, by chance, is pretty amazing.” He appreciated the colorful stories that he knew he would never hear anywhere else, especially in public. “Roll call is a time where rank does not matter and everyone is on the same playing field. We can have a few beers, relax and learn from each other — the good and the bad, so we don’t make the same mistakes,” shared Van de Pol who will soon be heading back to serve in the Netherlands, after serving six years at Edwards Air Force Base.